NEW PRODUCT – Bi-Color (Red/Green) 12-LED Bargraph [BL-AR12Z3010DUG-11] « Adafruit Industries – Makers, hackers, artists, designers and engineers! 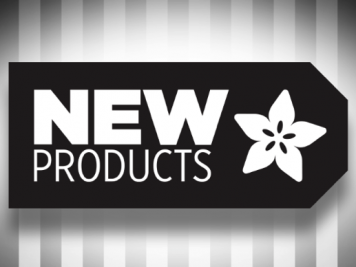 NEW PRODUCT – Bi-Color (Red/Green) 12-LED Bargraph [BL-AR12Z3010DUG-11]. 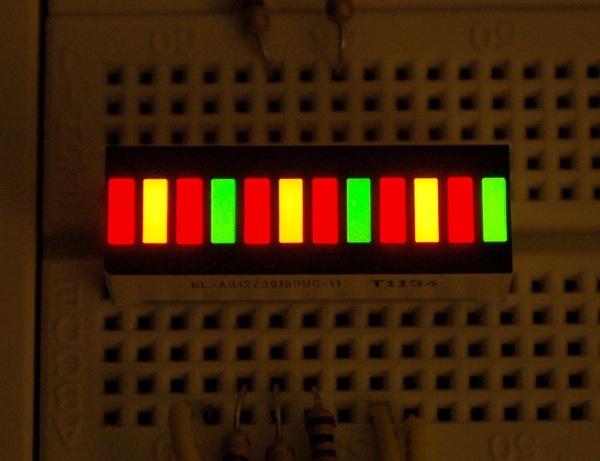 Make a small linear display with multiple colors using this elegant bi-color LED bargraph. 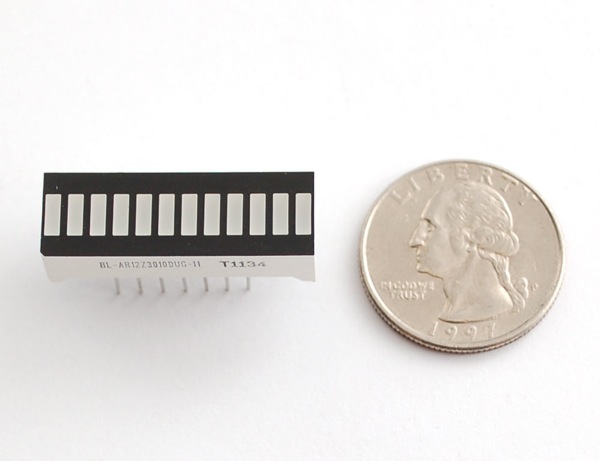 Only 1.2″ long, it is quite visible but not so large it wont plug into a breadboard! 24 LEDs are contained in the plastic body, 12 red 30mcd and 12 18mcd green. Every bar has two LEDs inside so you can have it display red, green, yellow or with fast multiplexing any color in between. This display is bright, beautiful and funky with nice diffused rectangular lenses for a striking look. There are 14 pins, 7 on each side, with 0.1″ spacing so you can easily plug it into a breadboard with plenty of space for wiring left over. Since the display is multiplexed we suggest using 3 PNP transistors to drive the anodes with microcontroller pins and then a 74HC595 to drive the cathodes.